Interview with Hon. Justice Augustine Ramadhani, President of the African Court on Human and Peoples' Rights on strengthening the rule of law in Africa. In this special edition of In Focus, we interview Hon. Justice Augustine Ramadhani, President of the African Court on Human and Peoples' Rights on strengthening the rule of law in Africa. President of the African Court on Human and Peoples' Rights on strengthening the rule of law in Africa. Originally from Zanzibar, Justice Augustine Ramadhani, is a retired Chief Justice of the United Republic of Tanzania, and the Peoples Republic of Zanzibar respectively. 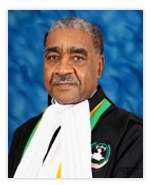 He is also a retired Judge of the East African Court of Justice, and retired Judge of the Tanzanian Court of Appeals. Justice Ramadhani has also held several positions during his career in the civil service including Deputy Attorney General of Zanzibar and also climbing up the ladder in the army to the rank of Brigadier General. In the wake of multi-party politics in Tanzania he served as the Vice-Chairperson of the National Electoral Commissions for both Zanzibar and the United Republic of Tanzania respectively.